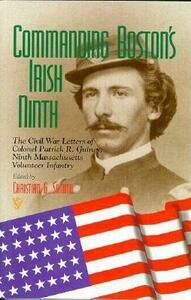 Commanding Boston's Irish Ninth: The Civil War Letters of Colonel Patrick R. Guiney Ninth Massachusetts Volunteer Infantry. Christian Samito writes in his introduction: "In reading Guiney's words, one can have a fuller appreciation of what motivated civilians to volunteer to fight a war and of the privations they suffered in service to their country." These are the collected Civil War letters of Patrick Robert Guiney, an Irish immigrant from Country Tipperary who relocated to Boston, Massachusetts. When the Civil War broke out, Guiney volunteered to defend the Union and, quickly rose from First Lieutenant to Colonel, to command the ninth Massachusetts regiment. A fervent supporter of Lincoln and passionately opposed to slavery, Guiney felt that, in his service to his new country, he was doing his part to gain freedom for the slaves. Being politically outspoken, Guiney was often criticized for his views by other Irish-Americans. His letters reveal not only the experiences and thoughts of an Irish Catholic soldier, but also the hidden tensions within his immigrant community. His views and observations not only illuminate his personal independence of thought, but also the political landscape which he tried to improve.